Reprinted from Bat Research News, Vol. 50: No. 2 (Summer 2009) with permission. Copyright 2009. All rights reserved. 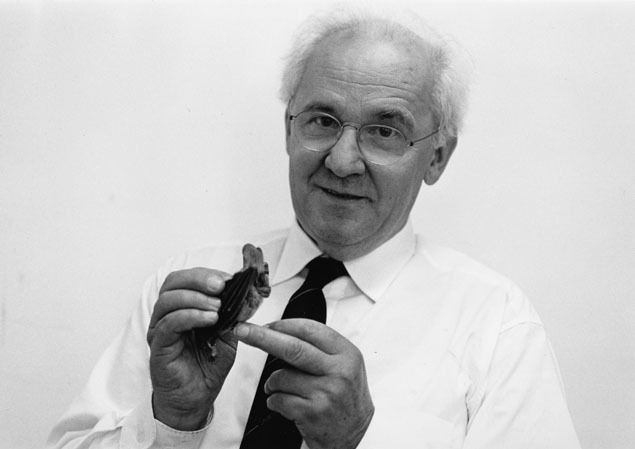 Gerhard Neuweiler, one of the pioneers in the study of bat echolocation, died on 15 August 2008, in a hospital in Munich after a prolonged illness. He was born on 18 May 1935, in a small village in the Black Forest region of Germany. After public school, he attended the Gymnasium in Calw and started his academic career as a student at the University of Tuebingen. There, he studied the physiology of vision in flying foxes, under the supervision of Franz Moehres, receiving his Dr. rer. nat. (Doctorate in Natural Sciences) degree in 1962. During 1963-1964, he pursued his studies with Megachiroptera at the Department of Zoology of the University of Madras in India, as a fellow of the government of India and of the German Academic Exchange Service. In 1964, he returned to Tuebingen as an assistant professor (1964-1970), and after his Habilitation (postdoctoral lecture qualification) in 1970, he was promoted to associate professor in the Department of Animal Physiology. At this time, his interest turned from vision and social behavior of flying foxes to the echolocation behavior of microchiropteran bats. His initial work in this field is documented by important papers on the echolocation behavior and spatial memory of Megaderma lyra and on the auditory threshold of Rhinolophus ferrumequinum. During this time, Gerhard and others developed the concept of working together democratically in a so called "Arbeitsgruppe," meaning a team of scientists with overlapping fields and common research interests. This concept proved to be very productive, promoting Gerhard's career enormously. He soon became the Chair of Zoology at the University of Frankfurt (1972-1980) and subsequently was named to the highly renowned Chair of Zoology at the University of Munich (1980-2003), where he continued to work in the tradition of Karl von Frisch and Hansjochem Autrum. In the field of echolocation, Gerhard's name is closely linked with the term "acoustic fovea," a specialization of the auditory system that is found in bats using long constant frequency echolocation signals and Doppler shift compensation. In a farewell party after his retirement, he made the statement that he considered this the main finding in his scientific career. However, he also published important reviews on "Foraging Ecology and Audition in Echolocating Bats" (Trends in Ecology and Evolution, 4:160-166, 1988) and on "Auditory Adaptations for Prey Capture in Echolocating Bats" (Physiological Reviews, 70:615-641, 1990), as well as a well-known book entitled Die Biologie der Fledermaus (Thieme Verlag, Stuttgart, Germany, 1993), which has been translated into English (Oxford University Press, New York, Oxford, United Kingdom, 2000). In the last years of his life, Gerhard became a friend of the composer Gyoergy Ligeti, whom he met during a one-year stay (2000-2001) at the School of Advanced Studies in Berlin. The friendship resulted in a book on "Motorische Intelligenz," in which the two authors exchange their opinion on the fascinating relationship between neurobiology and contemporary music (G. Ligeti and G. Neuweiler, Motorische Intelligenz-Zwischen Musik und Naturwissenschaft, Verlag Klaus Wagenbach, Berlin, 2007). By the end of his stay at the School of Advanced Studies in Berlin, Gerhard also finished a textbook on comparative neurobiology (Neuro- und Sinnesphysiologie, Springer Verlag, Berlin, 2005). His last book, which was published shortly after his death, can be seen as his philosophical legacy as scientist and teacher (Und wir sind es doch-die Krone der Evolution, Verlag Klaus Wagenbach, Berlin, 2008). Gerhard was not only a highly renowned bat researcher but also a very gifted administrator and organizer of large research groups, for which he was equally successful at obtaining research funds. He headed the Sonderforschungsbereich (special research area) "Neurobiology of Behavior" in Frankfurt and the Sonderforschungsbereich "Audition" in Munich, which were supported by the German Science Foundation. From 1978-1985, he was head of the Indo-German Research Project on Animal Behaviour at Madurai University, India. Besides his scientific work, Gerhard had a deep interest in science administration and politics. He was a member of the senate of the German Research Foundation (1991-1997) and member (1988-1994) and head (1994) of the Science Advisory Board for Germany. From 2001-2002 he was president of the German Zoological Society. Additionally, he was a member of the advisory boards of many research institutions. The importance of Gerhard's work is documented by numerous honors, including membership in the Bavarian Academy of Sciences, Munich, Germany; the Academia Europaea, Cambridge, United Kingdom; the German Science Academy "Leopoldina," Halle, Germany; and the Academy of Sciences Nordrhein-Westfalen, Duesseldorf, Germany. He also received the Karl Ritter von Frisch Prize of the Zoological Society and the Felix-Santschi Prize of the University of Zurich, and he was an honorary professor of the Department of Animal Behaviour and Neurobiology at Madurai University. Gerhard had an enormous, positive impact on many students and colleagues and on German science administration. He touched many peoples' lives for the better. We remember him with appreciation and affection, and we miss him a great deal. 1980s Habersetzer, J., G. Schuller, and G. Neuweiler. 1984. Foraging behavior and Doppler shift compensation in echolocating hipposiderid bats, Hipposideros bicolor and Hipposideros speoris. Journal of Comparative Physiology A, 155: 559-567. Neuweiler, G. 1984. Foraging, echolocation and audition in bats. Naturwissenschaften, 71: 446-455. Neuweiler, G., S. Singh, and K. Sripathi. 1984. Audiograms of a south Indiana bat community. Journal of Comparative Physiology, 154: 133-142. Link, A., G. Marimuthu, and G. Neuweiler. 1986. Movement as a specific stimulus for prey catching behaviour in rhinolophid and hipposiderid bats. Journal of Comparative Physiology A, 159: 403-413. Marimuthu, G. and G. Neuweiler. 1987. The use of acoustical cues for prey detection by the Indian false vampire bat, Megaderma lyra. Journal of Comparative Physiology A, 160: 509-515. Neuweiler, G., W. Metzner, U. Heilmann, R. Ruebsamen, M. Eckrich, and H. H. Costa. 1987. Foraging behavior and echolocation in the rufous horseshoe bat (Rhinolophus rouxi) of Sri Lanka. Behavioral Ecology and Sociobiology, 20: 53-67. Eckrich, M., and G. Neuweiler. 1988. Food habits of the sympatric insectivorous bats Rhinolophus rouxi and Hipposideros lankadiva from Sri Lanka. Journal of Zoology London, 215: 729-737. Neuweiler, G. and M. B. Fenton. 1988. Behavior and foraging ecology of echolocating bats. Pp. 535-549 in Animal sonar: processes and performance (P. E. Natchigall and P. W. B. Moore, eds.). Plenum Press, New York. Neuweiler, G. 1989. Foraging ecology and audition in echolocating bats. Trends in Ecology and Evolution, 4: 160-166. 1990s Neuweiler, G. 1990. Auditory adaptations for prey capture in echolocating bats. Physiological Reviews, 70: 615-641. Krull, D., A. Schumm, W. Metzner, and G. Neuweiler. 1991. Foraging areas and foraging behavior in the notch-eared bat, Myotis emarginatus (Vespertilionidae). Behavioral Ecology and Sociobiology, 28: 247-254. Roverud, R. C., V. Nitsche, and G. Neuweiler. 1991. Discrimination of wing beat motion by bats correlated with echolocation sound pattern. Journal of Comparative Physiology A, 168: 259-263. Schmidt, U., P. Schlegel, H. Schweizer, and G. Neuweiler. 1991. Audition in vampire bats, Desmodus rotundus. Journal of Comparative Physiology A, 168: 45-51. Schumm, A., D. Krull, and G. Neuweiler. 1991. Echolocation in the notch-eared bat, Myotis emarginatus. Behavioral Ecology and Sociobiology 28:255-261. Neuweiler, G. 1993. Biologie der Fledermause. Georg Thieme, New York. Neuweiler, G., and S. Schmidt. 1993. Audition in echolocating bats. Current Opinion in Neurobiology, 3: 563-569. Petri, B., G. Neuweiler, and S. Paabo. 1996. Extreme sequence heteroplasmy in bat mitochondrial DNA. Biological Chemistry, 377: 661-667. 2000s Neuweiler, G. 2000. The biology of bats. Oxford University Press, Oxford, United Kingdom. Pavey, C. R., C. J. Burwell, J-E. Grunwald, C. J. Marshall, and G. Neuweiler. 2001. Dietary benefits of twilight foraging by the insectivorous bat Hipposideros speoris. Biotropica, 33: 670-681. Pavey, C. R., J-E. Grunwald, and G. Neuweiler. 2001. Foraging habitat and echolocation behaviour of Schneider's leaf-nosed bat, Hipposideros speoris, in a vegetation mosaic in Sri Lanka. Behavioral Ecology and Sociobiology, 50: 209-218. Reprinted from Bat Research News, Vol. 50: No. 2 (Summer 2009) with permission. Web page by Margaret Griffiths, Publisher/Managing Editor, Bat Research News. Copyright 2009. All rights reserved.